These Funfetti® peppermint chocolate truffles are my latest addition to a growing batch of truffle recipes. 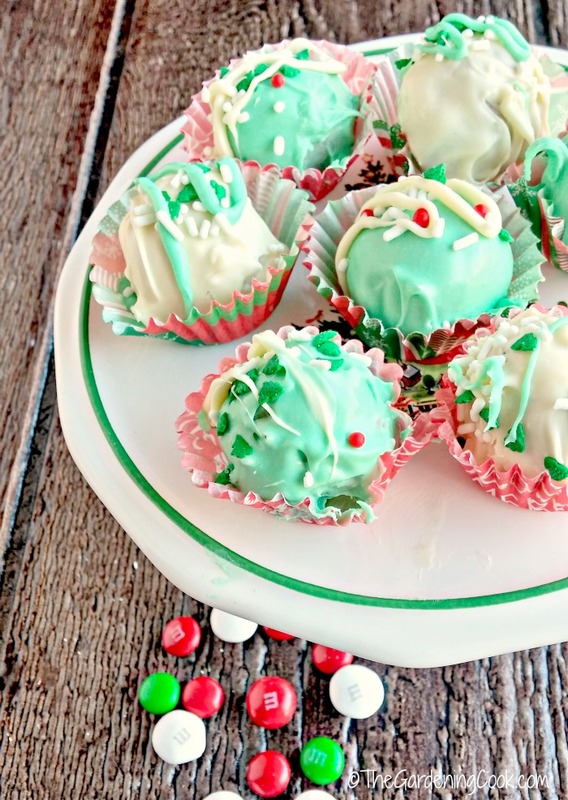 Add some fun to your holiday dessert table with these Funfetti® peppermint chocolate truffles. One of the most fun, and joked about, parts of a visit to my mother’s house is who will be emptying her candy jar of the M&M’s® that she always kept on the counter. It was always a contest between my sister Sally, and my brother Mark, and Mark usually won. The candy jar had a glass lid, so there was no mistaking the sound when someone went down to the kitchen “for a glass of water” and we heard that distinctive clink! Mum passed away earlier this year, but her holiday traditions carry on. 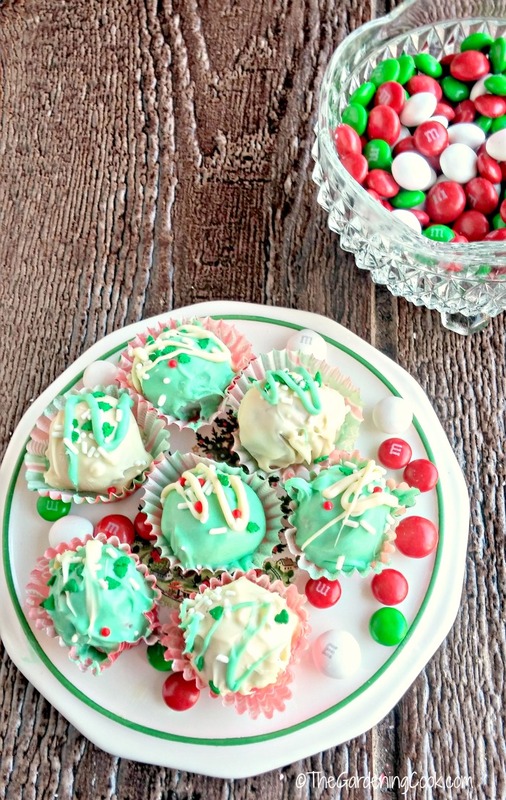 I thought it would be fun to come up with a candy recipe for my Christmas dessert table using M&M’s®, and these peppermint chocolate truffles were born. 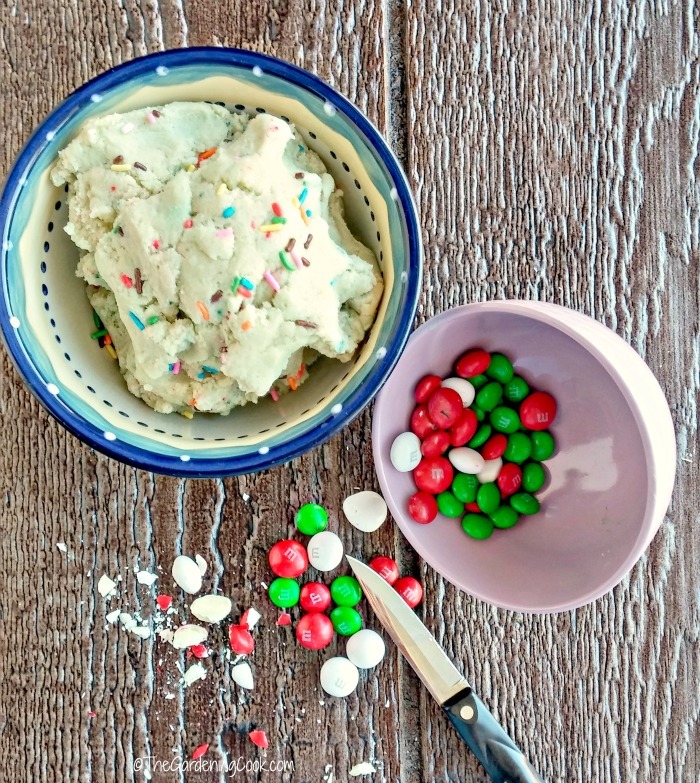 My M&M’s® helper for this recipe is both the white peppermint and the holiday milk chocolate varieties. Add that to some Pillsbury™ Funfetti® cake mix, frosting and a bit of milk and these poppable sweet treats will delight your friends and family. Perhaps they will become your new holiday tradition? The truffles are super easy to make. First mix your cake mix with some flour, butter and sugar. Then mix in the vanilla extract, salt and 2 % milk. Some Pillsbury™ Funfetti® Holiday vanilla frosting joins the mix to come up with a batter that is pliable, and not too liquidy. Add the milk slowly so that you get a good consistency. 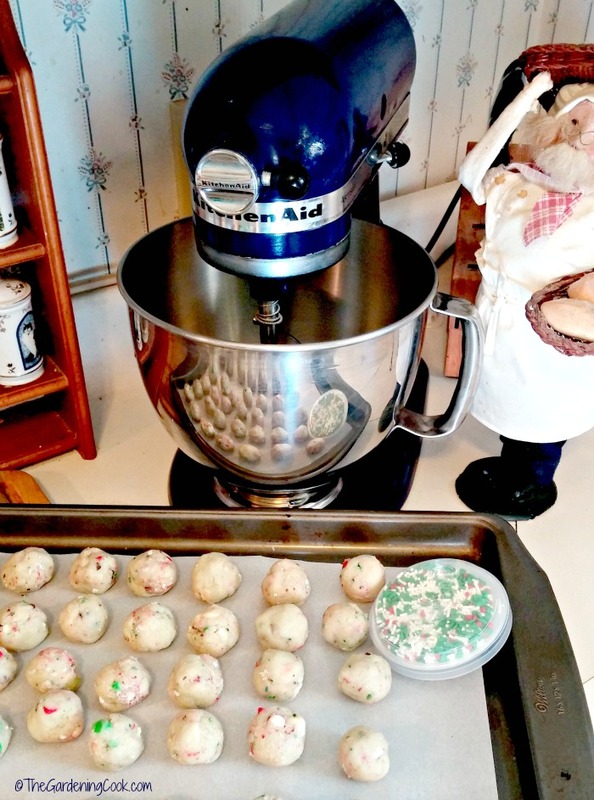 I love making all my holiday baked goods in my Kitchen Aid mixer. Mum had one exactly the same and I learned to cook mainly by watching her in action. 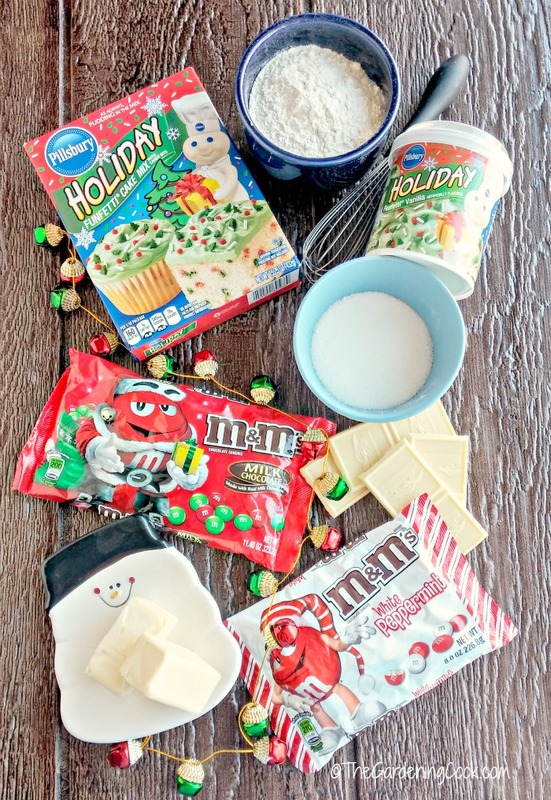 Chop up the M&M’s® Holiday Milk Chocolate and M&M’s® White Peppermint and add these with the sprinkles from the cake mix to the batter. Don’t use the mixer beater. Fold them in by hand so that the color does not run. 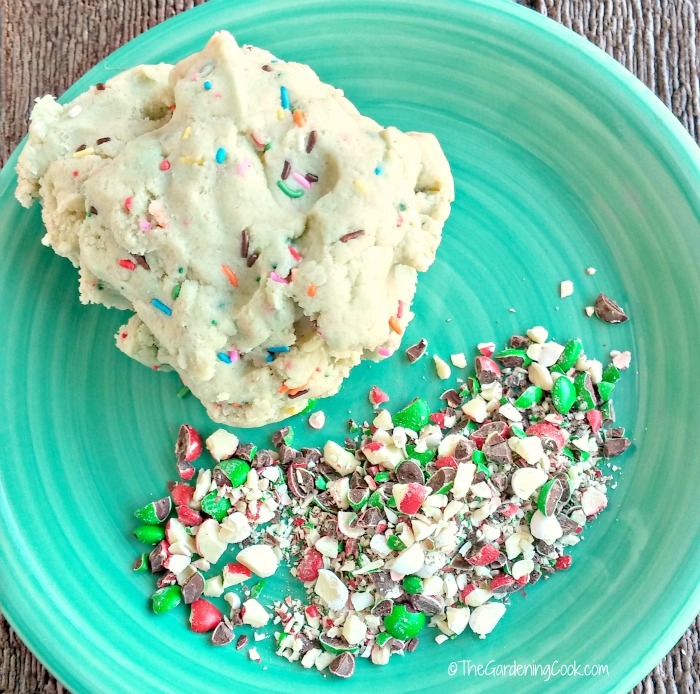 If you are a fan of peppermint desserts, be sure to also check out my Rice Krispie Peppermint ball cookies. They are also perfect for Christmas. Now comes the fun part. I don’t know what it is about using my hands to make truffles, but i find it soothingly relaxing. Just shape the dough into 1 inch balls and into the fridge they go to set for a while so that they are easier to handle when you get ready to coat them. I made two kinds of coatings for these truffles. The first was pure white baking chocolate melted and topped with the sprinkles from the Funfetti® frosting mix. The second coating was the actual Funfetti® frosting mixed with baking chocolate and a bit of milk added to make it the right consistency and then topped with more sprinkles. The hardest part of the recipe is the coating. Melt the chocolate and drop the truffle balls in one by one. Swirl the truffles in the chocolate or Funfetti® frosting, swirl with two forks, and then remove with a fork and tap the edge of the container to remove excess chocolate. Be sure to add some of the sprinkles before the coating sets for each ball. Trust me, the more of these you make, the better you will get at the coating part. It is so worth it for the final product!! At the end, I placed the left over coating mixes into small zip lock baggies, cut a tiny corner off and drizzled each truffle with the opposite coating for a pretty effect. I used a silicone baking mat on a baking sheet to let my truffles sit. Clean up is a breeze with these mats. No kitchen should be without them. 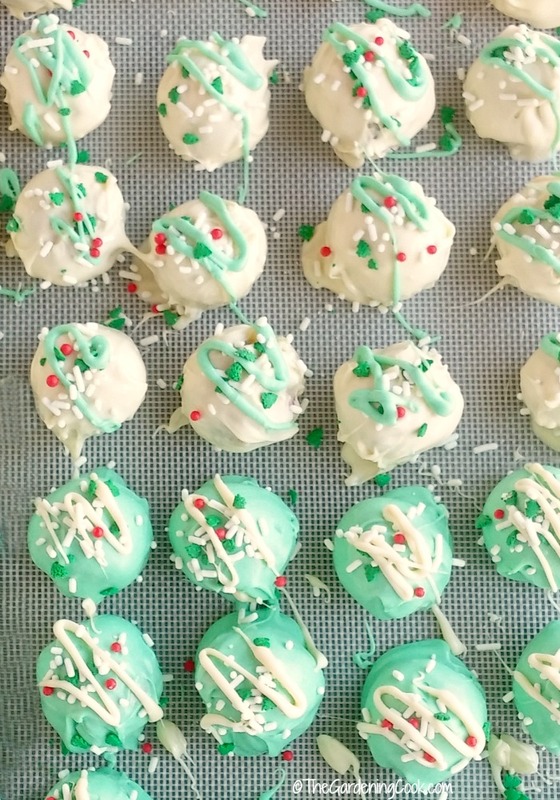 These Funfetti® peppermint chocolate truffles are the perfect ending to a lovely holiday meal. They are very rich with a creamy cake like center and crunches of the M&M’s® Holiday Milk Chocolate and M&M’s® White Peppermint. One delicious bite is all you need, but go on…you will want two ~ one of each topping. The frosting/chocolate dipped ones are sweeter and are more like a petit four cake. The plain chocolate have a more decadent pure chocolate taste and are more like candy. Both are TO DIE FOR! The flavor is sort of a cross between cookie dough and candy. The truffles are rich, buttery, chocolaty, smooth, just plain delicious with just a hint of indulgence. Everything a good Christmas treat is made of. So it’s fa la la time. Place a plate of these nearby while you trim the Christmas tree and watch them disappear! Anyone who cooks over the holidays will probably use milk in their recipes. But all over the country this holiday season and beyond, hungry children and families are missing out on the essential nutrients supplied by milk. This is an item that is not typically donated to food banks – even though it’s in high demand. Would you like to help? For a small donation at Pour the Love, The Great American Milk Drive will deliver a gallon of milk – and all of the essential nutrients, that it provides – to a family who is in need in your local community. Your small donation can make a big difference in the life of those in need. 1 cup Pillsbury™ Funfetti® Holiday cake mix. In the bowl of a stand mixer, beat together the butter and sugar until combined. Add the cake mix, flour, salt, and vanilla and mix everything together thoroughly. Add 3 tbsp of milk (or more if needed to make the batter the consistency of dough.) Add 2 tbsp of the Pillsbury Funfetti® frosting mix. You will want the dough to be pliable, not liquid. Mix in the chopped M&M's® by hand. (don't use the mixer. You don't want the colors to run.) Reserve the Funfetti frosting sprinkles for the coating. 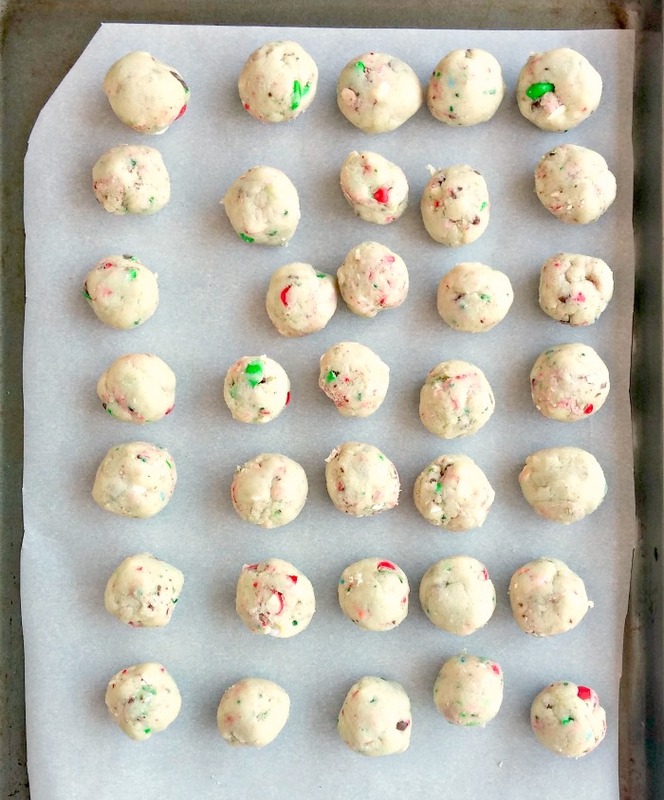 Roll the dough into one inch balls and place on a silicone baking mat over a cookie sheet. Chill the dough balls in the refrigerator for 15 minutes or until they are firm. While dough balls are chilling, place the white baking chocolate in a microwave safe bowl and cook in microwave at 30 second intervals until it has fully melted. Be sure to stir the contents in between the cooking intervals. To make the Funfetti® frosting topping, mix the frosting with 4 ounces of white baking chocolate and 1 tbsp of milk. Microwave in 30 second bursts until it is smooth and the desired consistency. Drop each truffle in the middle of the melted chocolate. Swirl the chocolate all around it with a fork. Pick up the truffle with a fork. Tap the fork on the edge of the bowl to allow the excess white chocolate to drip off. Place them back on the silicone mat. Do this in batches, shaking some of the sprinkles over the truffles before the coating sets. Do this for half of the truffles. Repeat the procedure for the other half. Place the remaining coatings into two zip lock bags, snip a tiny hole on the corner and drizzle each truffle with the opposite coating for a festive look. Once they are all coated, place them back in the fridge to set for another 15 minutes. When the truffles have completely set, store them in an airtight container and keep them in the fridge until you are ready to serve them. Enjoy! Hope you enjoy them Heather. Our family loves the taste! Thanks Samantha. Glad you like them! This is hands down one of the best truffle recipes I’ve seen! I can’t wait to give these a try. Thanks so much for sharing them! Thanks Stacie. They were so much easier to make then I thought they would be. Oh my, those look so delicious! My husband and I like to host parties for various holidays and I get in panic mode when I cannot decide on what foods to make. This recipe looks so easy too. Thanks Alanna. It surprised me how easy they were to make. So tasty too! would have never known you used cake mix for these! Love this recipe! It made them so easy to make too! Wait!! They have Peppermint M&M’s? I have Mint but not peppermint! I need to go get these! This recipe looks SO good! They are by far my favorite variety to taste. Very different taste and so good. These would make great holiday treats! I love the thought of making these for Christmas. Truffles are one of my favorite holiday treat. Aww I love this idea. 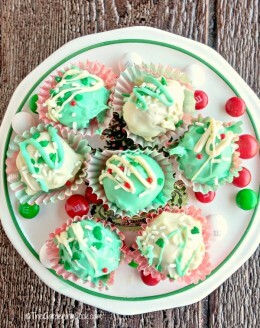 I would love to make some of these cute treats for one of the family holiday parties. Thanks Liz. I hope you like them. These look yummy and fun to make without being too hard for my mediocre cooking skills. I’ll have to give them a try. Super easy and so tasty too. This looks nice! I am sure kids will love it. Thanks for sharing this. My pleasure Maurene. Hiope the kids enjoy them. Funfetti truffles?? What?? These look amazing and I bet they taste even better!! Super tasty and easy to make too! These look so good! My family and I love to eat these, maybe we should make them some time and then eat them lol. 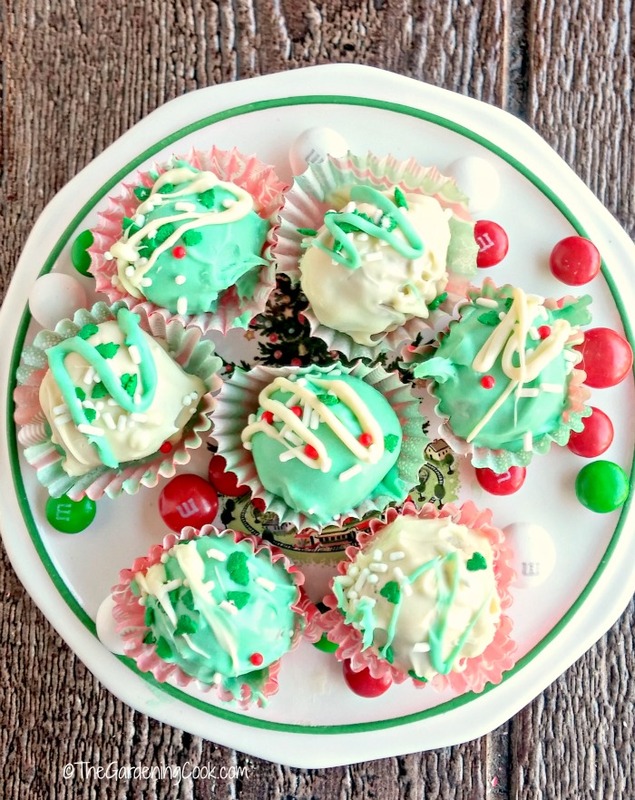 These Funfetti Peppermint Chocolate Truffles look so good and would be perfect to make with the kids during the holidays. Kudos to both Pour the Love and Great American Milk Drive for helping so many families this holiday season. I love the giveaway for the KitchenAid Mixer too. The truffles look so good! I would love to make them not only because they would be yummy treats but because I know, in my own little way, that I am helping push the Great American Milk Drive to reach more families in need. It is a wonderful cause. Yum! These look great. I love how they turned out. So very festive too! I love funfetti and would love to try them! 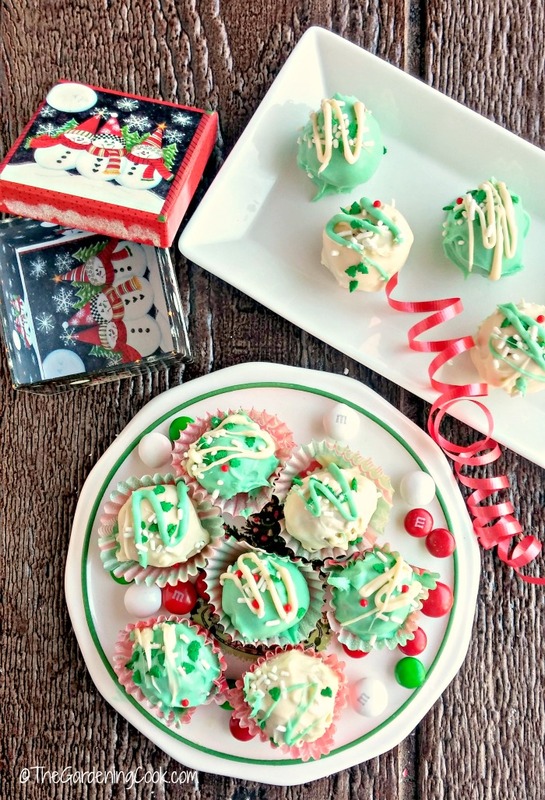 They are super easy to make and taste just like the holidays! This looks like a fun recipe to make with the kids. I will have to grab the ingredients we need to make them. These are so festive. I made some cookies yesterdaybut not as colorful as these! I was going to make them all white and then the reverse idea hit me! The chocolate truffles look so festive and yummy. I can’t wait to try your recipe. These look so good. I haven’t tried making truffles before. I might have to give it try. I’ve been on a truffle mission lately, it seems! Wow not only do these look tasty but I know the kids would enjoy making them. This looks like the perfect way to spend the afternoon and a perfect treat for the holidays. Hope they like them Shaney. These look and sound so amazing! 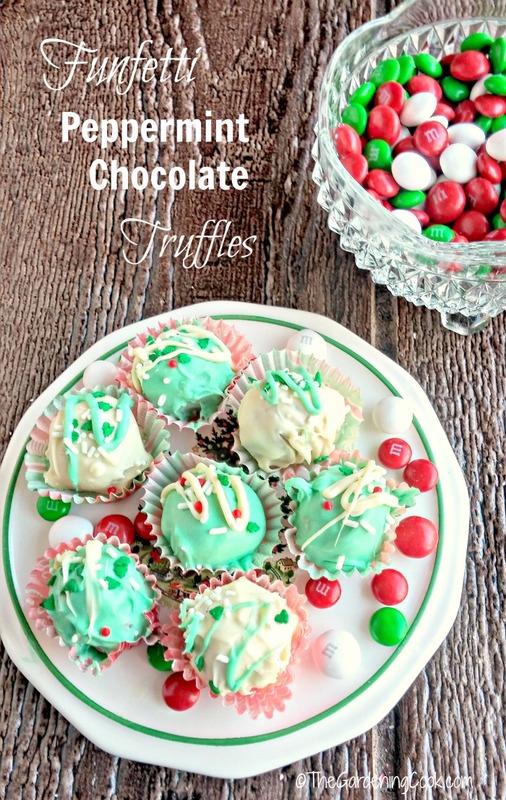 I would love to make these this holiday season! I’m a sucker for anything with peppermint. These look like a perfect holiday treat! They’re just right for a Christmas party. I am in love with those M & M peppermint flavored candies. So different. This look yummy and I love M & Ms. I’ll have to test these out for the holiday party we’re having. Thanks for the recipe. Anything with Funfetti and I AM IN!! This looks like something I can make with my 16 month old and it looks so yummy. Thank you! Have fun cooking and enjoy them!